The current international attention on the nuclear deal with Iran obscures another much-trumpeted nuclear accord signed a decade ago — between the United States and India. 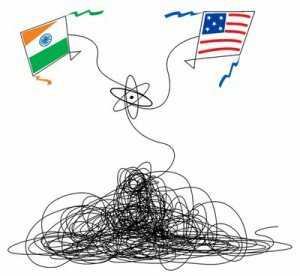 On the 10th anniversary of the U.S.-India nuclear deal, six words sum it up: Built on hype, deflated by reality. Indeed, it has become the forgotten nuclear deal. The deal indeed symbolized warming ties between the once-estranged democracies. The deal also became a legacy-building issue for Bush and Singh, just as U.S. President Barack Obama sought the Iran nuclear accord as the biggest diplomatic achievement of his presidency. At its core, the Indo-U.S. deal-making centered on finding a compromise between an India determined to safeguard its nuclear military program and an America that insisted on imposing stringent nonproliferation conditions. As part of the deal to bring India into the international nuclear mainstream, New Delhi opened the sizable Indian civilian nuclear program to permanent international inspections, signed an additional protocol with the Vienna-based International Atomic Energy Agency, dismantled its Cirus plutonium-production reactor, and harmonized its export policies with the guidelines of U.S.-led technology-control regimes. But a decade later, the deal’s much-advertised energy, technological and strategic benefits for India still seem elusive. Indeed, the deal has yet to be commercialized. The premise on which it was founded — that India could build energy “security” by importing high-priced, foreign fuel-dependent reactors — was, in any case, a pipe dream. For the U.S., however, the deal was more geostrategic in nature, designed to make India a major U.S. arms client and coopt it as a quasi-ally. The deal did help place the U.S.-India relationship on a much-higher pedestal. But bilateral ties had begun to significantly improve much before the deal. And the strategic rationale that has brought the two countries closer remains independent of the deal. For the U.S., displacing Russia as India’s largest arms supplier has been a diplomatic coup. Given the heavy political investment in it, the deal eventually will be operationalized, however belatedly. It will, however, take a minimum of 10 years thereafter for the first nuclear power reactor under the deal to come on line in India. After all, the international plant-construction time frame, with licensing approval, now averages at least a decade, with the vast majority of reactors currently under construction in the world plagued by serious delays and cost overruns. For example, the Areva-designed plant in Finland, on Olkiluoto Island, is running at least nine years behind schedule, with its cost projected to rise from €3.2 billion to €8.5 billion. The Russian-origin plant at Kudankulam, at the southern tip of India, took 13 years to be completed, with the second of its two reactors yet to be commissioned. In this light, the U.S.-India deal is expected to deliver its first commissioned reactor a generation after being signed. If India’s reactor imports were governed by “technical and commercial viability” — in Prime Minister Narendra Modi’s words — not a single contract would be feasible. The stalled Indian negotiations with the French firm, Areva, over the price of power suggest that the deal’s commercialization would be dictated neither by technical nor commercial viability but by the extent to which India is willing to fork out subsidies to support high-priced imported reactors. Indeed, it is a moot question whether the deal will ever yield substantive energy benefits, given the exorbitant price of foreign-origin reactors, the concomitant need to heavily subsidize electricity generated by such plants, and the grassroots safety concerns over the Fukushima-type multi-plant nuclear parks that India has earmarked for Westinghouse, GE-Hitachi and Areva, each of which is to sell prototype Light Water Reactor (LWR) models presently not in operation anywhere in the world. The accident-stricken Fukushima reactors were also the first of their kind. The nuclear power dream has faded globally. The crash of oil and gas prices, coupled with skyrocketing reactor-construction costs, has made nuclear power’s economics more unfavorable than ever. Few new reactors are under construction in the West, with the troubled nuclear power industry desperate for exports. Even as the global role of nuclear power appears set to become marginal, India stands out today as the sole country in the world wedded to major reactor-import plans. Washington has long pandered to the Indian weakness for the deal’s consummation, with its decade-long negotiations characterized by shifting goalposts. Gone is the pretense of Washington extending India “full” nuclear cooperation or granting it “the same benefits and advantages as other leading countries with advanced nuclear technology, such as the U.S.,” as the 2005 deal stated. Gone also is the original accord that India would “assume the same responsibilities and practices” as America. Instead of meeting its commitment to adjust domestic laws and guidelines of U.S.-led multilateral regimes to “enable full civil nuclear energy cooperation and trade with India,” the U.S. actually worked with its Congress and with the Nuclear Suppliers Group (NSG) to bar exports to India of what New Delhi really needs — civilian enrichment and reprocessing equipment and technology, even though such transfers would be under international safeguards. Consider another issue: Years after the U.S. pledged to bring India into the four American-led technology-control cartels — the NSG, Missile Technology Control Regime, Australia Group, and Wassenaar Arrangement — India is still pleading for its admission. It is now filing a formal application for admission to each regime, in the hope that the U.S. would be more forthcoming in its support than it has been so far. Even in the event that India is admitted to the regimes, the technology controls it still faces will not go away. These regimes are designed to harmonize export policies, not to promote technology trade among member-states. The key fact is that U.S. nonproliferation policy has yet to treat India on a par with another nuclear-armed country outside the Nuclear Non-Proliferation Treaty (NPT) fold, Israel. Against this background, India’s diplomatic overinvestment in the deal has already made it harder for it to address more fundamental issues in its warming relations with the U.S., including an increasingly one-sided defense relationship and munificent U.S. aid implicitly subsidizing the Pakistani military’s export of terrorism. Could the deal with Iran follow the trajectory of the deal with India — a great strategic move, followed by protracted negotiations on follow-up steps, moving goalposts, and the gradual diminution of the original accord? It is possible, but in one fundamental aspect, the two situations are different: Even without a nuclear accord, the U.S. and India would still have become close partners. Brahma Chellaney is a geostrategist, author and longtime Japan Times contributor. This entry was posted in Energy-Environment, U.S.-India nuclear by Chellaney. Bookmark the permalink.